pure aluminum thermal base, 2 high-efficient heat pipes with 6mm diameter, 2 high-efficient heat pipes with 8mm diameter, the 9 aluminum pillars traversed heatsinks and dual low speed cooling fans. 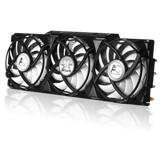 These 4 high-efficient heat pipes connect the surface of the GPU directly, providing the cooling transfer effect of 8 heat pipes. The technique of pillars traversed can quickly bring the heat from aluminum pillars to the 8 layer cooling fins by direct contact. 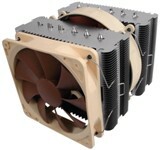 The perfect combination of the heat pipes and the pillars traversed cooling fins technology provides superior cooling efficiency and greatly enhances the cooling performance of GPU, video memory ,MOS circuit and NVIO on the PCB, let gamers to enjoy good overclocking margin and cooler GPU, guarantees stable system operation even under round-the-clock full load gaming. Industry leading 3-way NVIDIA SLI technology offers amazing performance scaling by implementing AFR(Alternate Frame Rendering), under Windows Vista with solid ,state-of-the-art drivers. Designed for the new PCI Express 2.0 bus architecture offering the highest data transfer speeds for the most bandwidth-hungry games and 3D applications,while maintaining backwards compatibility with existing PCI Express motherboards for the broadest support. Blazing-fast RAMDACs support dual QXGA displays with ultra-high, ergonomic refresh rates –up to 2048x1536 @ 85Hz. Able to drive industry’s largest and highest resolution flat-panel displays up to 2560x1600 and with support for High-bandwidth Digital Content Protection(HDCP). Provides ultra-smooth playback of H.264, VC-1, WMV and PEG-2 HD and SD movies. Hardware acceleration for HD picture-in-picture enables a complete HD movie playback experience. pulldown cadence. PureVideo uses advanced processing techniques to detect poor edits, recover the original content, and display perfect picture detail frame after frame for smooth, natural looking video. Let's have a look at the packaging of Calibre X265!